As you are gathering your ideas and your materials to create a concrete fish pond on your property, one of the elements you cannot overlook is the pond sealer paint. There are many options on the market that might seem as though they can do the job, but you need to know some of the best characteristics to look for with your paint. The following are some of the most crucial elements when you are choosing your paint. Is It for the Pond? First, you need to make sure the pond sealer paint that you want to use is truly sealer paint for the pond. You can’t simply use the same sealer you have for the garage floor just because it is concrete like your pond. You need to be sure you are using a sealer paint that is specifically for ponds – there is a difference. A typical concrete sealer paint might be water resistant, but it may not be fully waterproof, for example. The pond sealer paint will be beneath the water constantly. Of course, one of the elements that can never be mentioned enough is toxicity. You never want to use a toxic pond sealer paint, as it will have disastrous effects for the plants and fish in the pond. You might be thinking that it is okay to use a toxic option if you are just going to be putting water into the pond, but that’s not true. Even though you might not add fish, there will likely be birds and other critters that come to your pond to drink or cool off. You do not want them to be exposed to harmful chemicals in the water. Fortunately, you will find that most of the paints on the market are very easy to use. In fact, they will go on just like normal paint, meaning you can use a brush or a roller. However, you will want to see just how many coats you need to use. Some of the top brands will require just a single coat. Will It Work in Your Environment? Also consider where you live. Do you live in an area where it is hot throughout the year? Do you live in a location where the ground freezes in the winter and where you get a lot of snow? You want to have a pond sealer paint that is guaranteed to work in your climate, so it will not suddenly crack because of freezing temperatures. In addition, make sure you check the durability of the pond sealer paint. 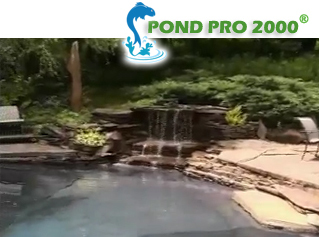 Ideally, you will have a pond that can last for many years without an issue. However, if you buy low-quality paint that’s not right for the job, you may find that you have leaks before long. It’s better to take the time to find a truly durable and reliable pond sealer paint. While there might be quite a few potential pond sealer paint options on the market, the tips listed here can help you narrow down your choice so you and your pond will have only the best results. This entry was posted in Pond leak Sealer, Pond Paint by admin. Bookmark the permalink.